A French woman working for an international organisation in Yemen's capital, Sanaa, has been kidnapped, the French foreign ministry says. Security sources say gunmen seized the woman and her Yemeni driver on Tuesday morning as she was going to work. 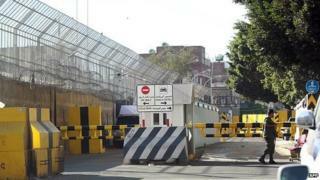 The French foreign ministry, which closed its embassy in Sanaa in February, said it was trying to locate and free the woman. It gave no further details, but urged French citizens to leave the country. Yemen is a base for al-Qaeda-affiliated militants and foreigners have been targets of kidnappings in the past. The security situation in the country sharply deteriorated after President Abdrabbuh Mansour Hadi resigned in January following a takeover by a Shia militia group, the Houthis. On Saturday he escaped his house arrest and fled to the southern city of Aden where he has since said he is withdrawing his resignation and resuming his duties, and has branded all measures adopted by the Houthis "null and illegitimate". In its first official statement since the Mr Hadi's departure from the capital, the Houthi group said the president had lost his legitimacy as head of state and was being sought as a fugitive of justice. The political turmoil which followed the takeover caused several countries, including France, to close their diplomatic missions, withdraw staff and call on their nationals to leave the country.